With Faux Finishes, your home will be literally transformed! Faux techniques are painted on your walls and the fabulous effects are not achievable by any other method. 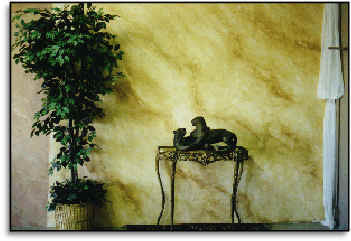 Faux methods include simulating the walls in an old Italian villa-Fresco, color washes, marbleizing & more. Plus, Faux Painting is usually less expensive than wallpaper, better for home resale and the hottest design style—look in any decorating magazine. A Faux Finish can also give new life to outdated furniture & decorative items. Additionally, have your unsightly brass and copper chemically aged, resulting in a beautiful, authentic Verdigris (green) finish. While faux effects can be done by amateurs in its simplest forms such as sponging, there's a mega-leap into greater sophistication with granite, tortoise and wood finishes, crackle woodwork, and even murals and frescoes. It goes from crafts to artistry depending on the skill of the person manipulating the paint. "A real professional can make it awesome!" No matter who does it, it all starts with a good, solid-color, rolled-on base foundation upon which to build the desired finish. Water-based or oil-based paints can be used, but not together. Water-based paints dry faster, and the clean-up is simple, thus making it ideal for the beginner. Oil-based paints take longer to dry. This is useful for more complex techniques such as combing and glazing and is often the choice of professional wall artists. But the final effect is what is most important, whether one wants a transparent illusion (oil-based) or a powdery one as in Pompeian frescos (latex). SPONGING is considered the simplest of techniques. It also covers a multitude of sins on not-so-perfect sheetrock and textured walls, or even tightly adhered, painted-over wallpaper. After the solid color base coat dries, a second, and even third and fourth color is applied by hand: a piece of sponge is dabbed into paint and applied randomly to the wall. A slight twist of the wrist keeps it from looking too uniform. A natural sea sponge, rather than cellulose, is recommended. A second, slightly more difficult technique, is called RAGGING. One makes a dabbing "roll" from plastic, terry, sheeting, burlap, whatever. The material determines the final result. COMBING involved a squeegee with "teeth" cut into it that is dragged through the top color from ceiling to floor in one swoop — without stopping. It can also create squiggly, wavy or checkered effects. This works better with oil-based paints, as it can't be done correctly if the paint dries too fast. GLAZING is the finish of high-end decorators. Glaze is not a technique; it is a product which suspends pigment in a transparent medium that is applied in multiple layers in multiple coats. One of the the latest techniques is to use water-based polymer rather than an oil-base. Glazing can take anywhere from three to 30 coats, and can have 50 to 100 appearances depending on the result one wants. Layering dark over light, or light over dark, depends entirely on the furnishings of the home and the designer's concept. Call for more information and an estimate.